Plan your 2019 Summer Vacation NOW - Book as only the week of Aug 17th prime week remains. A RENTERS QUOTE: "Thank you for your clean, cozy cottage for a week. We very much enjoyed it." A RENTERS QUOTE: 'We enjoyed your cottage so much. Everything was wonderfully cared for and organized. A Beautiful Place; thanks for sharing it with us'. A RENTERS QUOTE: 'We had such a wonderful, wonderful time in your cottage in Eastham. We loved being in that location with our 2 kids, and it was perfect for us to be able to watch them on the playground while relaxing on your deck'. A RENTERS QUOTE: 'We had a great time at your cottage. It was so nice and we loved that the pond was so close by!! It was a great experience'. A RENTERS QUOTE: 'You clearly take great pride in your cottage and have it set up wonderfully'. 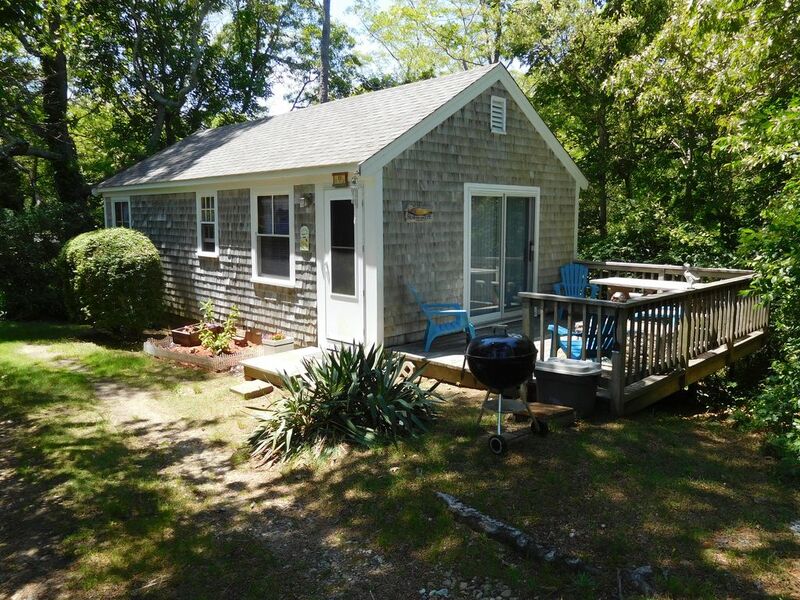 A RENTERS QUOTE: 'We certainly enjoyed our stay at your Nauset Haven home. We had a beautiful week in every way'. A RENTERS QUOTE: 'We had a fabulous time! Your cottage is lovely. I really liked the decor and homey atmosphere and our daughter loved all the activites around for children'. A RENTERS QUOTE: 'All the comforts of home while we were away'. Surrounded by trees, set back, secluded and private, our cottage has a large deck with a peek view of the 21 acre, fresh water, Minister's Pond, located just 200 feet away. Just a few steps from the cottage to our private beach to swim, or to just pull up a chair and sit and relax. Fishing from the docks or from our brand new Rowboats. Adjacent Play Area and Game Room for the kids. Part of Nauset Haven on Minister's Pond, a small 9 cottage complex, we are set back about 100 feet from the other cottages with our own private driveway. Located just past the National Seashore entrance. Convenient to everything. Relax and enjoy your vacation. We have now added WiFi to our freshly re-carpeted and tiled, renovated, modernized and fully equipped cottage with two bedrooms, double bed and two twin beds. Living Room has pull out full sized futon and a large slider, with a view to make you stay 'home' and relax. Plus, walk from the cottage right out on to the large deck. Picnic table, grill. Basement area to store bikes. We provide the pillows, blankets and bedspreads, you must provide your own sheets and towels. No pets, please. Bright, airy with everything you need to make your vacation relaxing, enjoyable and memorable. Everything you want to do or need is just a short walk or drive away. Only 20 minutes to P-Town. Eastham is one of the loveliest areas on 'Lower' (or outer) Cape Cod, only 3.5 miles wide where we are, so you're never far from either Cape Cod Bay or the National Seashore, stretching for miles and miles on the Oceanside. Beach activities abound, but you can also: Bike the CCRT (Cape Cod Rail Trail)...go hiking...enjoy antiquing...flea market shopping....see the Cape Cod Baseball League...go whale watching...shop in Chatham or P'Town...or JUST RELAX and get away from it all.